Once rare like a legendary loot drop, new MMOs are more common the ever. And as part of a genre built upon freedom and vast numbers of players coming together, they’re among the most ambitious games around. Each one promises a sprawling world, a vibrant community, and enough content to make Geralt blush and go all dizzy. New MMORPGs are full of potential, but they’re also precariously close to failure - history is littered with MMOs that have had their moment in the spotlight or never garnered the attention they deserved. In the interest of saving you hours spent in character creation for a game you might not even like, we’ve compiled a handy 2016 list of the new and upcoming MMOs that are actually worth your time. From anime and wuxia mash-ups to cyberpunk first-person shooters, these are the new MMOs you might want to take note of. With combat taken straight out of an on-wire martial arts film and anime-inspired visuals, Blade & Soul is an MMORPG with a decidedly East Asian aesthetic. After years of success in other territories, NCSoft have taken the plunge by launching Blade & Soul in the West, and it’s already picked up a massive audience of fans in the UK and US. Blade & Soul’s main draws are its compelling, stylish combat - which feels closer to that of a fighting game than anything we’ve seen from an MMO - and its bountiful character customisation options. It’s largely standard fare as MMORPGs go, but the bonus of a ready-made community, original combat and heaps of costume unlocks make Blade & Soul a worthy newcomer. While we’re with Korean-made MMOs, Black Desert Online is another promising new kid on the block. Set in a medieval fantasy world where two rival nations are wrapped in an endless conflict, Black Desert Online is in many ways a quintessential MMORPG. However, developer Pearl Abyss have elevated the sandbox elements with an intuitive parkour system, dynamic weather effects, large-scale siege battles and a combat system that relies upon precise manual control. Pearl Abyss built their title from the ground up in a new game engine in order to handle the demands of their massive, seamless sandbox - add to that an absurdly deep character customisation system and you’ve got some serious rendering needs. With hundreds able to take part in a single battle alongside additional AI combatants, watching the carnage that unfolds during a castle siege is enough to excite any MMO skeptic. Combine science fiction with high fantasy and you’ve got the least traditional setting for an MMORPG imaginable. Greatswords clash with mechanical arms and shields block machinegun fire - Skyforge is mad, sure, but it’s brilliant too. The whole premise is gloriously absurd, with players creating their own divine hero and heading out to recruit an army of worshippers and become the best god in all the land. The gameplay isn’t quite as imaginative as the setting with point and click combat, raids and quests forming the bulk of what you’ll be doing in Skyforge. 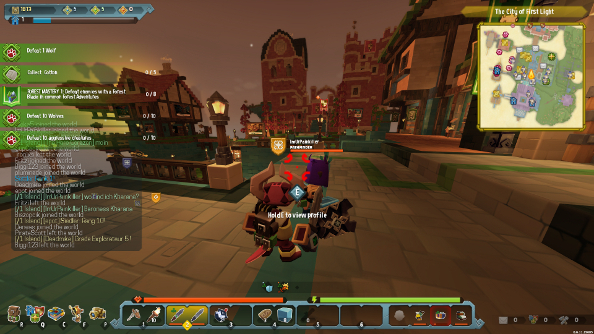 However, the ability to swap between classes and skillsets freely lends combat a uniquely liberating quality, allowing players to choose their build between combat encounters. Star Conflict is an MMO that ditches the archetypal high-fantasy worlds of castles and forests in exchange for a sci-fi sandbox full of alien ruins and powerful intergalactic empires. Its premise is a simple one: pick one of hundreds of incredibly detailed spaceships before heading out to explore an enormous galaxy, engaging in PvE and PvP combat wherever you find it. What ensures Star Conflict remains compelling is how well it works on both a micro and macro scale. One-on-one dogfights and massive space battles are equally addictive, and the sheer number of ship models, upgrades and crafting options means there’s plenty to keep players invested long after their first few forays into Star Conflict. Ostensibly a large-scale first-person shooter, Ghost in the Shell Online leaves behind the cerebral science fiction of its source material and instead focuses on fast-paced, teamwork oriented gameplay. Players choose from a selection of classes, each with unique skills and abilities inspired by characters from the manga series, and fight in a variety of PvE and PvP game modes. The main draw, aside from the hugely popular franchise it’s based on, is the complex and engrossing customisation options that players can use with their cyborg characters, with up to 5,000 variations possible. Ultimately Ghost in the Shell Online is a solid FPS with an emphasis on teamwork and a rich system of upgrades and unlocks. Since the rise and rise of Minecraft, building mechanics have become something of a go-to feature for new MMOs. SkySaga might share some blocky DNA with Minecraft, but it has enough new features of its own to make it a game that’s worth your while. Each player begins on their own homeworld - this is their base of operations and here they are free to build and roam to their heart’s content. Things delineate further from the Minecraft formula when players go portal-hoppingfrom their own world to an infinite number procedurally generated quest worlds. Each one contains a main mission objective to be completed - usually by making it through a dungeon or beating a tough enemy - and rewards the player with unique loot, resources and crafting recipes. Players can also launch raids on another player’s homeworld, adding a sinister edge that is occasionally lacking in Mojang’s titanic craft-’em-up. The enduringly popular Warhammer 40,000 universe is the setting for this combat-heavy MMORPG. Players pick from four franchise factions - Space Marines, Chaos Space Marines, Orks, and Eldar- each with five sub classes, before entering into massive multiplayer matches, completing objectives and racking up kills in order to progress their character and further their faction’s cause. Developer Behaviour Interactive have drawn upon 28 years of 40k lore to create the stories, battlefields, characters and equipment of their game, ensuring there’s plenty of content to keep franchise fans engaged. On top of that, Eternal Crusade also boasts frenetic skill-based combat, with melee, ranged and vehicular warfare featuring alongside one another in multiplayer matches. Eternal Crusade is an action-MMO befitting of the franchise title. Classic MMO principles lie at the core of Visionary Realms’ Pantheon: Rise of the Fallen. The developer has promised to introduce a new generation of players to the group-focused adventuring and challenging combat that was once the norm for the genre. Pre-quest preparation and strategic team coordination are key to completing Pantheon’s dungeons and bosses, most of which are simply impossible to beat solo. Social interactions are crucial. Players will need to find allies in one another, trading and fighting together in the high fantasy setting in order to succeed. While lone wolf objectives are available, the bulk of content is intended for completion by groups, making this an MMORPG with a keen focus on cooperative gameplay as opposed to individual mastery.